This past Sunday, I was lucky enough to attend the Smithfield Pig Save in Smithfield, Virginia. I, along with my mom and three dozen other people, gathered on the corner of a very busy intersection to politely protest against Smithfield pork production and the consumption of animals. The event was scheduled for three hours and my mom and I stayed a little over two and a half. And in those two and a half hours I witnessed four trucks loaded with pigs go by. My heart just sank when they went by, and even more when the returned empty. I felt so accomplished being out there putting my core beliefs into action. I was protesting for something that I believe in. Something that's important. According to Peta, almost thirty million pigs are slaughtered every year in Smithfield, Virginia. Now, I haven't always had an "A" in math, but I know that that's a lot of pigs being slaughtered every day. Something that I admired about the people Sunday night, was that some of them ran up to the trucks when they were stopped to comfort and talk to the pigs. The pigs never knew love, but for a few seconds they were told that they were loved and cared for. Some people also took photos to document the pigs inside the trucks. 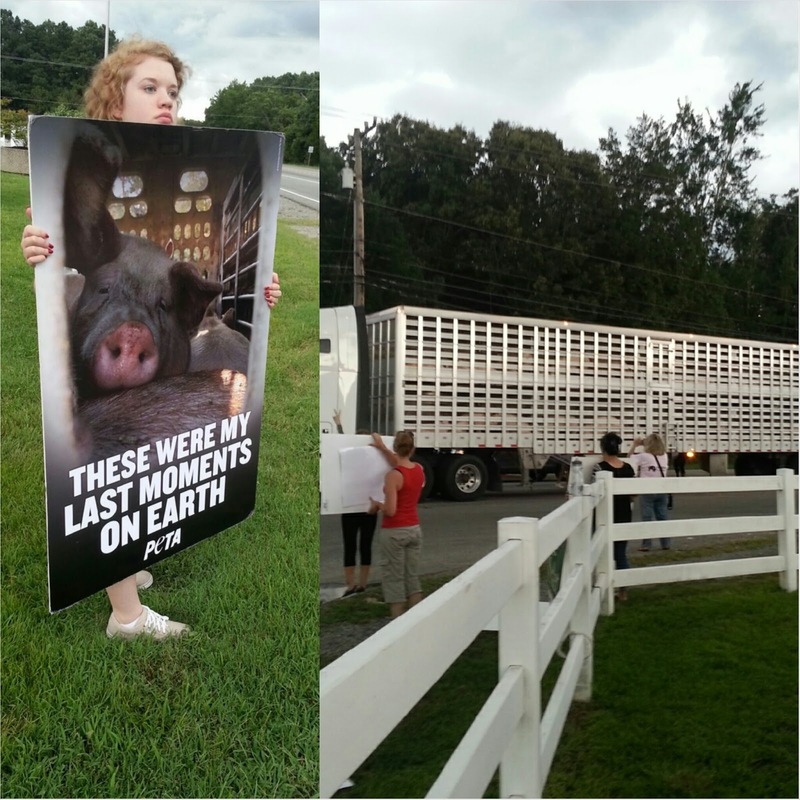 I hope someday soon I'll have the courage to run to the trucks and see the pigs like many other people did. I started this blog on Monday, and on Wednesday I watched Farm to Fridge on YouTube. After watching this short, 12-minute documentary, I was even more happy that I went to the Smithfield Pig Save on Sunday. I'll go to every protest I can to fight for these animals. Sunday's protest was a great first experience for me. It was so nice to be surrounded by like-minded people and when I left, my heart just felt so happy. These people were kind and generous enough to bring awesome vegan food and really nice, well-made signs. Everyone was welcoming and nice and it's so amazing to think that there are people out there who care enough to organize these kinds of events! They may be small, but they can be very effective. I'm looking forward to doing this again soon.